Unarguably we find the answer in the life and salvation of Jesus Christ. Undeniably the miracles of His virgin birth, death on the cross, and resurrection from the grave hold the key to eternal life and ultimate joy. But what if in addition to these awaited a miracle revealed in Jesus' three years of public ministry, the roughly 1,000 days that followed His life of otherwise relative obscurity--the 1,000 days that were intentionally lived and documented? 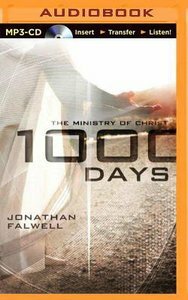 In 1,000 Days Jonathan Falwell presents the unique chance to study this miracle, looking closely at those last three years in Jesus' life and revealing vital information from the gospels for our lives today. Meet Jesus like never before when you take a second (or maybe third or fourth) look at what He said in those 1,000 days. Each chapter also includes a special Bible study for use either by individuals or small groups. About "1000 Days (Unabridged, Mp3)"
Who is God and What Does He Want With Me?